This review will cover all three national tournament OVAs; the 13 episode long National Tournament Chapter, the 6 episode National Tournament Semifinals, and the 7 episode Finals. As the name suggests, Prince of Tennis is a sports anime about tennis. That much is clear the very second you hear about the anime, even if you don't know anything else but the name. At the beginning of the main series I wasn't exactly sure what to expect, perhaps something pretty similar to most of the other sports animes I've seen, meaning something relatively realistic but still somewhat overexaggerated and overly dramatic sports matches, in a good way of course. After some time the show turned out to be something quite different; it's a pretty clever mix of sports and shounen combat anime, while never going completely to the shounen combat side. The three OVAs together are the last story arc to the long-running Prince of Tennis, and continue straight where the original 178 episode series left off, except more faithful to the original manga than the final parts of the anime series. 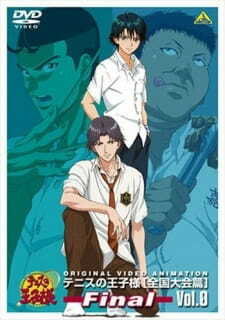 The anime revolves around Seishun Gakuen school's tennis club and its regular members, one of the members, Ryoma Echizen, a 7th grade tennis prodigy, being the main focus. The story of the OVA is very straightforward and quite simple, but it doesn't have to be anything complex; the Seigaku tennis team has finally reached their long-sought goal, the national tournament, the most challenging and most important tournament of the whole Prince of Tennis series. Being that, this tournament is the definite climax of the show. Several new opponents are introduced, all national level, who push our heroes to their very limits. While the premise of the story might not sound the most original for a sports anime, the idea of having one-on-one and two-on-two sports matches with teams is actually very unique, and the matches are intensive. The execution of the story deserves a good score. The art is excellent in every aspect, the visual quality has improved since the main series. I simply love the drawing style and character designs. The characters' looks have tons of personality, and their facial expressions convey their feelings and emotions well. The backgrounds are well detailed and colorful, and create a great atmosphere. The animation is great and very consistent; it's very clean and fluid, and the characters' movements look very natural. Their limbs move just like I would expect from a tennis player. Also worth mentioning are the visual effects, which are stunning. The sound effects sound always realistic and convincing, nothing there made me think anything sounded different than it should. The opening and ending songs are okay, far from my favorites from the series, but not bad. The background music often creates a good atmosphere and adds the right mood. Not all, but some of the background music has a certain old-school style flavor to it, which is not a bad thing, in fact I like many of the BGM tracks a lot. Maybe I've just heard some of the tracks so many times they always bring back some of my favorite moments from the anime, but I'm really glad the OVA still has the same BGM from the original series, even though by the beginning of the "Finals" OVA it had already been almost seven years since the original series started airing. Not all the BGM tracks are great, but there isn't a single track I'd say I dislike. The music was fitting for every scene. The voice acting is handled really well, the voice talents do their job superbly, and many of the voices fit the characters perfectly. All the Seigaku regulars from the series are present in the OVAs, with many of the central supporting characters. The main cast is great, it's relatively large and quite varied. It features many different types of personalities, from which every fan should be able find their own favorites. Each Seigaku regular is unique and have their own quirks. There are also many interesting supporting characters, who are also well designed. We got to know a lot about the characters throughout the long main series, the main cast and many of the regular supporting character all have their own personal history, and many things are told which let the viewer better understand them. Even though the story has already proceeded as far the the national tournament, and the matches are naturally the main focus, you'll be mistaken if you think "Nationals" will only be a race through tough opponents. Though not much, among other things it has some character development too; some characters show new, and sometimes surprising, sides of themselves, while never being out of character. The only big complaint about the characters would be some of the lesser supporting characters, who have kept appearing throughout the whole series, while almost nothing was ever actually told about them. They have simply remained kind of vapid and grown hollow. Prince of Tennis, the 178 episode series together with the National Tournament OVAs, 204 episodes altogether, has definitely been one of the most enjoyable anime experiences I've had. Though it started slow, it kept me in its grasp the whole time. When I finished the Finals OVA it felt strange that it was all finally over, it left me longing for more. The national tournament OVAs were very entertaining and I really enjoyed them, and I'm looking forward to a possible second season, which would be based on the New Prince of Tennis manga. Prince of Tennis wasn't the most realistic nor accurate sports anime to begin with, but in the national tournament it went kind of over the top. Many of the new special moves introduced in Nationals are far more unrealistic and illogical than ever before, and the mechanics of many unusual techniques are never explained, which sometimes bothered me, but not to such an extent as to affect the enjoyment. There isn't much I felt the OVAs lacked, there was drama and some really funny comedy, and the matches and character interaction were very satisfying. Although it could have helped a lot if it was even one episode longer, because at times I felt things were going a bit too fast. And I would have wanted to know more about the characters' lives after the tournament. The anime is a great shounen type experience with great characters and matches, that separate it from other sports animes, and Nationals is a good sequel with high production values that finishes the story of the series. All in all, a great end to a great series. A solid 9. There are still far more people who have finished the main series, than those who have even touched the OVAs. The OVA series made the anime complete, so for those who liked the main series but still have not seen the national tournament OVAs: mada mada dane, you still have lots more to work on. Do not miss this, as it will be the climax that will bring our heroes' journey to conclusion. Highly recommended, even if you're new to Prince of Tennis, in which case just make sure you watch the main series first. And as the anime will most likely be more enjoyable when not taken too seriously,those who would much rather watch anime with serious themes, than follow a group of youngsters' journey toward the top, spiced with comedic moments and overly dramatic matches, might not necessarily enjoy PoT that much. So the most arrogant and show-off sports protagonist returns together with his teammates to play in the most awaited tournament that they’ve been waiting for; the national tournament. The drama is even more far-fetched and can be extremely over-the-top; players are on the verge of dying just by PLAYING tennis, losing memories before an important game, bloods are spilling everywhere. I mean come on! I almost forgot that I am still watching a tennis story particularly, the finals arc. I completely understand that it’s going for a more dramatic, theatrical and cooler approach as it is after all the ENDING. However, there’s also the concept of TOO MUCH and being incredibly over done. Somewhere along the way, it becomes absolutely far-fetched. I notice that the comedy part really improves. It is no longer far-fetched and can be genuinely funny. And if there are several exaggerated moves and techniques from before, this time they even added stances with supposedly amazing auras which are extremely exaggerated. Of course, as it is a new chapter it is given that there’s an arrival of new characters. As always, the opponents are arrogant as ever. And if last time there is quite a few nasty opponents, this time some are even nastier and barbaric because they would even resort to hitting couches and elderly people. Well, when opponents are like that it feels even greater when they are amazingly defeated. There are also character developments for not only the main characters but for recurring characters as well. Characters are more expressive this time particularly the ones with poker faces like Tezuka. Some opponents are a lot stronger now as we see some of powerful characters gets beaten or really push to the limit. I believe the most noticeable improvement is the animation. As always, this series loves exaggerated moves and very fictional techniques during matches. And if in the last season it was made so over the top, this time it improves quite a bit. It is a little bit cleaner now. It looks better and cooler. It’s not that far-fetched compared from the previous season. It might still be exaggerated but at least it is done a little better this time. The improvement of the character design is also very noticeable. It is true that as always there are countless exaggerated elements in the series. You could even say that it is even more this time. But I guess that just how the series is. I myself may not like that part of the series but I believe it is quite effective for some. And I enjoyed it more compared to the previous one.